Smiles all round at the Ciutat Esportiva with Barça having reached their fifth Copa del Rey final in a row thanks to their 0-3 aggregate win over Valencia in the semi-finals. 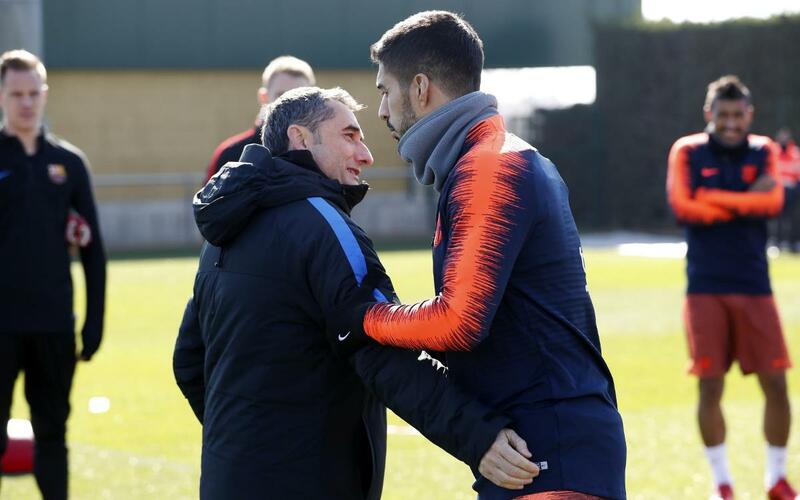 The players returned to work and took the opportunity to congratulate coach Ernesto Valverde on the day of this 54th birthday. The session was a recovery one for the first team squad and they were joined by Samu Araujo, R.Tarín, Morer from the B squad and by U19 player Iñaki Peña. Ernesto Valverde continues breaking records in his debut season in the FC Barcelona dugout. Having already taken the team to their best ever unbeaten start to a LaLiga season, he continues to reach new milestones and has led Barça to a fifth consecutive Copa del Rey final. The coach has won over his players with his personal touch and that is not just something that we have seen in training this Friday. Coinciding with the Barça coach's 54th birthday, we hear from some of the players he has helped to success thus far in 2017/18. Leo Messi, Luis Suárez, Andrés Iniesta, Jordi Alba and Ivan Rakitic are among those praising Valverde's work since he arrived last summer. Since he joined the club, they have been in spectacular form in LaLiga, the Copa del Rey and the Champions League. Don't miss the players' words about their coach in the following video!